This week promises another great evening of Singer/Songwriter performances! 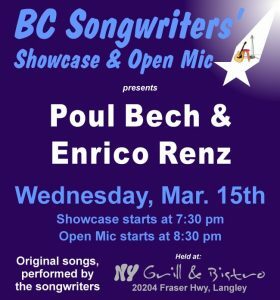 On Wednesday, March 15th, the Songwriter Showcase will feature Poul Bech & Enrico Renz, starting at 7:30 pm… Open Mic follows at 8:30 pm. The BC Songwriters’ Showcase & Open Mic are held at NY Grill & Bistro – 20204 Fraser Hwy, in Langley.